MariaDB firewall by DataSunrise is a proactive defense mechanism against intruders and vicious insiders. The solution is based on efficient threat detection and elimination algorithms. It immediately notifies the firewall administrator in case of detecting suspicious user actions, signs of a security breach, or an attempt to inject malicious SQL code. It fully controls access to Maria DB and does not keep any sensitive information, like passwords. 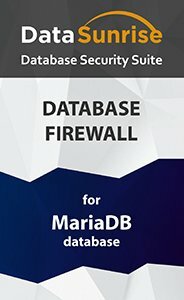 MariaDB firewall by DataSunrise is a high-performance solution created for all-round protection of production and non-production databases from outside and inside threats. It continuously analyzes and filters database traffic and blocks requests that meet forbidden security rules. It defends information against malicious attacks, prevents data leaks, both intentional and unintentional, and detects early signs of data breach preparations. The firewall also helps organizations to successfully comply with industry key standards and regulations, ensuring the required level of data security. Deployed in a proxy mode the firewall resides between database and clients and provides real-time tracking of user activity and changes made to database tables. It audits, logs and filters all queries. Filtering decisions are made based on administrator-defined rules. SQL injection is one of the most dangerous types of database attack, which can severely compromise data security and integrity. DataSunrise stops SQL injections in real time. The firewall blocks the main SQL injection techniques: Union Exploitation Technique, Boolean Exploitation Technique, Out of band Exploitation technique, Time delay Exploitation technique, Automated Exploitation. DataSunrise Database Firewall runs on Windows and Linux and supports MariaDB 5.5+.